Visit San Francisco Travel for hotel and visitor information. Visit 511.org or call 511 (888-500-INFO – outside of Bay Area) to plan your trip using public transportation or to check real-time traffic conditions. Please contact sally@poeticsofaging.org if you are available to share a ride or need a ride from the North Bay, South Bay or East Bay. onto Starr King Way. Take Starr King one block and turn left onto Franklin Street. 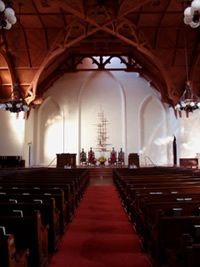 The church is located immediately on your left, between Starr King and Geary Blvd. Street Parking: Take note of the one-hour parking signs, Monday thru Friday – they extend until 6 PM on the east side of Franklin and until 7 PM on the west side. They are not always enforced on Saturdays and do not apply on Sundays. Open 6AM to 12:30AM Sun-Thurs. Open 6AM to 2:30AM Fri & Sat.